31B Hosts OMBH… | Ouch!! My back hurts!! Today’s post is a few hours later than usual… the reason will shortly be revealed. I’ve added another string to the bow… yes, I have! 😉 While in Kilcock for the market on Saturday and Sunday I went looking for the skipper of 31B. Not only did I get to meet MF but beg a ride off him as well! I also met Blackthorn’s family… the two grand old ladies being the stars of the show! After packing up at the market… rather disappointed with my showing… I head back to 31B. The relaxed atmosphere on board is the perfect antidote for a weary body and tired mind. There is quite a bit of activity in the harbour so MF delays the departure of 31B for a few hours… let the folk have their fun while we chat… about life and boats… blogs and books… but mostly about boats. 31B is an old working boat… her construction started some time in 1911… that makes the maths easy. She was built in Northern Ireland and as MF suggests… she may well have cruised past the Titanic at the Harland and Wolff on her way down to Dublin! 31B was built for a private company so she was given a fleet number… that’s why she is still known by that number today. She may well have been (unofficially) called Williams and Wood… or simply the ‘Jam Boat’ because that’s what W & W transported! Sh*te… what now? I soon realise that although we are moving less than 4 miles per hour the lady needs constant attention… memories of flying days come flooding back… constant small movements on the controls! The operative word being constant! 31B is not a small vessel… we drag her bottom in the silt on a number of occasions… that’s not too bad… we keep moving… planning to make Enfield before dark… at about 22h00. The last mile approaching Cloncurry’s Bridge is bad! Weed, silt and reeds… the going is very slow, hard work… in places we have to do the backwards and forwards trick… to cut our own trench! You may wonder why all the bother? This is what a lot of folk have been working a very long time for! To cruise the whole length of the Royal canal. As MF says… the canal conditions will only improve now that it is officially opened and being used by the bigger boats! MF makes a call for stopping at the bridge for the night. She that must always be obeyed and senior son come to collect us… we all sit in the wheelhouse for a short chat before heading home… leaving MF in peace. Only thing… we’re invited back for more fun in the morning… this morning! My express task… to do a ‘live’ blog from the boat! So… to help I loaded a few of the photo’s before leaving home… don’t want to make the post too large… I will do a more comprehensive gallery for another post. 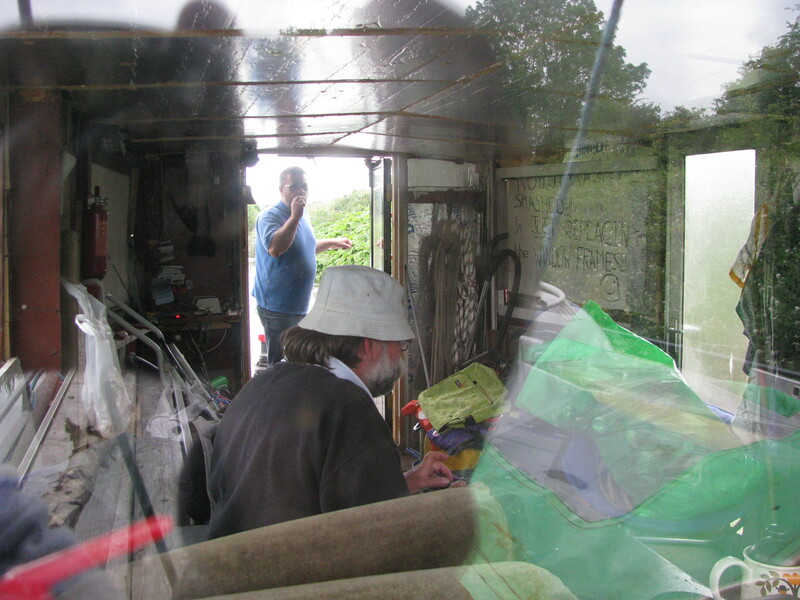 We arrived back at the barge at 10h00 this morning and got underway after prop cleaning duties. Not even 100 meters after Cloncurry’s Bridge the fun really started… it must have taken a good hour to move two hundred meters… MF eventually powered 31B through the silt. This entry was posted in #Royal Canal, Dublin & Leinster Architecture & Other Interesting Sights and tagged #boats, #Royal Canal, 31B, canal locks, Co Kildare, Co Meath, Enfield, HBA, IWAI, Kilcock. Bookmark the permalink. Very nice!!! Looks like you had a great trip. Awaiting news of the outcome of your meeting this week! Here I’m sitting in an office, typing away, and there you are… boating! Glad you had fun, V.
Great fun! It was special but also quite hard work! The old lady has no modern technology like power steering and auto pilot! She has to be man handled… well, could be woman handled as well! I’ll say something in a post about the two days… later! You have fun at the typing… don’t forget to keep us posted on the positive outcome of that meeting!! This is a really cool experience being on the boat and blogging.